Well, another year comes to an end and the holidays are about to begin. What better way to spend your time off than sitting back comfortably and allowing me to entertain you with some of my latest After Effects CS5 tutorials? Here’s a free tutorial movie for you, taken from the “Jumpstarts” section of the video2brain After Effects CS5 Learn by Video DVD that I created this year in collaboration with Todd Kopriva from Adobe. You’ll also find lots of other free tutorials alongside this one so please enjoy them and let us know what you think. You can read what Eran Stern said about our DVD training here in his blog. 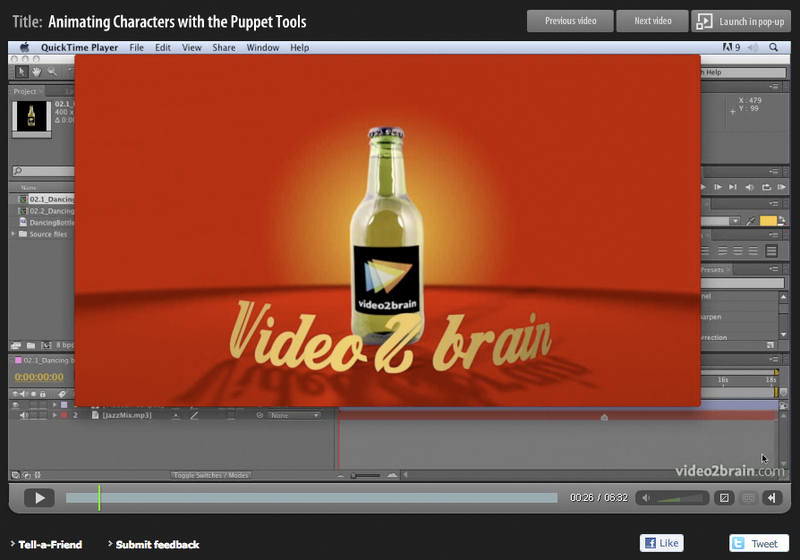 After Effects has great tools for character animation called the Puppet tools. The Puppet Pin tool places a mesh over your footage using the alpha channel. You can add points to this mesh that allow to distort it and animate it, providing some really natural movement for your animations and motion graphics projects. The Puppet tool is as fun to use as a kids toy so get stuck in, have some fun and learn how to use this great set of tools to create your own fun animations. You can also find links to lots of other free tutorials and an extensive reading list right here on my website. Announced today is the astounding next version of After Effects, along with the other professional video and audio applications such as Premiere Pro and Audition. I’ve had my hands on the next version of After Effects and I’m hooked, I’m sure you will be too. Here’s a run down on my favourite features and improvements.